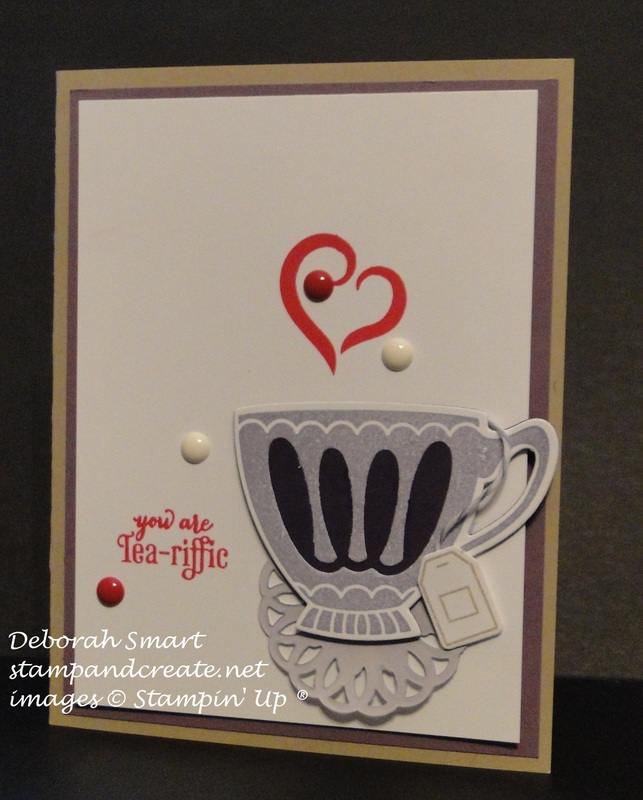 Thanks so much for stopping by, my stamping friend! Did you see yesterday’s post for the Wacky Watercooler Blog Hop? If not, just scroll down to read my post, then click through the other sites and see lots of fabulous ideas for the new Occasions catalogue and Sale-A-Bration products! After you read this post, of course!! I have to admit that when I first did my pre-order, I only ordered the stamp set & framelits bundle; I didn’t order any of the other products that coordinate with them. After making a couple of cards, though, I immediately saw how I could ‘step them up’ if I had some of the paper and embellishments – and those are the projects that you saw in my post yesterday for the blog hop! As I said, I did make a couple of cards without all the extras; I think they look just fine, so I thought I’d share them with you today. After all, we can’t always buy everything at once, so I didn’t want you to think that it’s an ‘all or nothing’ proposition with this set! 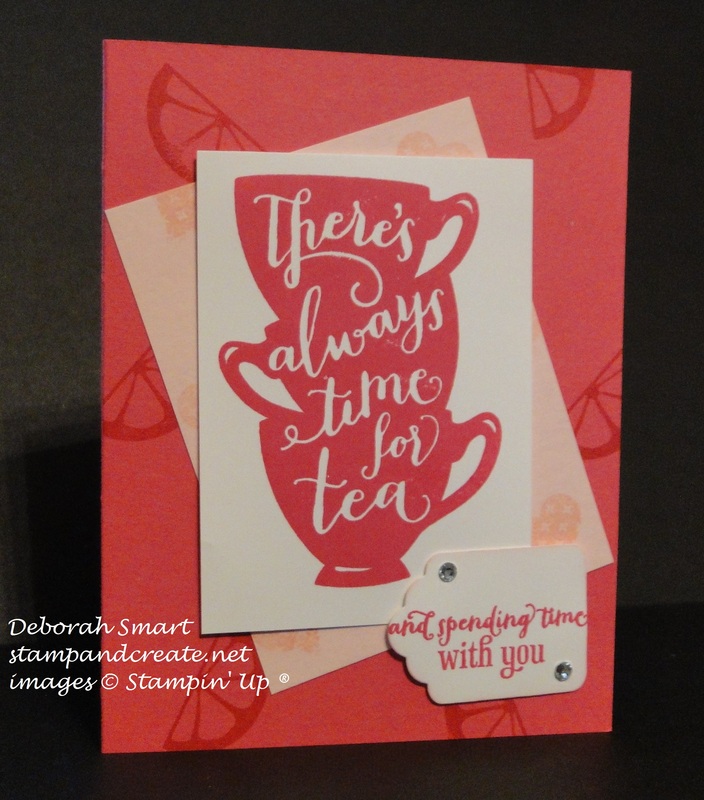 As you know, I find ‘clean and simple’ cards difficult to do, so when I saw a card made by the talented Mary Fish (I think of her as the queen of CAS), I decided to CASE it (which stands for Copy And Share Everything – a credo every stamper stands by!) and made this card, with a couple of small touches of my own. The tea bag was stamped with Basic Gray ink and die cut, then I attached some (retired) Wisteria Wonder Baker’s Twine to the tea bag, and attached the other end to the inside of the tea cup. I wanted a small doily for under my cup, so I used one of the small Metallic Foil Doilies, flipped it over to the back, which is plain white, and sponged it with a Dauber and Wisteria Wonder ink. I attached these to a panel of Whisper White cardstock, then stamped the sentiment and heart in Real Red ink, and attached a couple of White Perfect Accents and the Red dots (from the Holiday catalogue) onto the front. I then layered it onto a panel of Wisteria Wonder cardstock, then onto a card base of Crumb Cake. This is a nice simple card, and it came together quick quickly; you could easily make several of these for thank you, or thinking of you cards. On the focal panel of Whisper White cardstock, I stamped the large image in Melon Mambo ink. I love this image; it creates the highlights for you – so you don’t need to think about light direction, and proper placement for drawing in your own highlights! I then stamped the sentiment in Melon Mambo ink onto Whisper White, and used the Tags & Labels Framelits to die cut it. A couple of Rhinestones Basic Jewels later, my card was finished! Again – another card that is quick & easy to make, with few supplies. Okay, I’m finished sharing my projects with the A Nice Cuppa set with you for now; I’ll be back tomorrow with more projects, this time featuring the awesome Sale-A-Bration set ‘Sky is the Limit’.